The flock of taxi and rick shaw drivers that greets us as we pull our bags from below deck is standard in any bus depot (if you can call the single desk transport office at the coastal town a depot) and after one or two polite but firm declines from us, we're happily strolling in the direction of the Atlantic. The sometimes frustrating but always intoxicating streets of Marrakech (a city named one of TripAdvisor's Top 10 Destinations in the World for 2018 and our first port of call on this Moroccan adventure) already a distant memory, we're immediately refreshed as we hit the promenade with no idea yet as to where our riad is located. 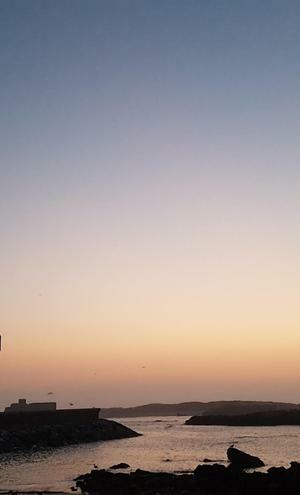 We're not in a hurry, of course, and neither is anyone else it seems, as we take the crisp sea air into our lungs and struggle to make out the horizon in the mist. 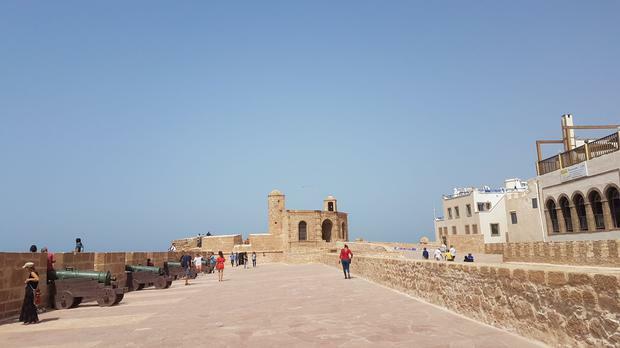 Following our spidey senses (and, more tangibly, a pack of rather placid former fellow bus passengers) we're guided in through the city's Bab Sbaa ('Sbaa gate'), and into Essaouira's dreamy old town. 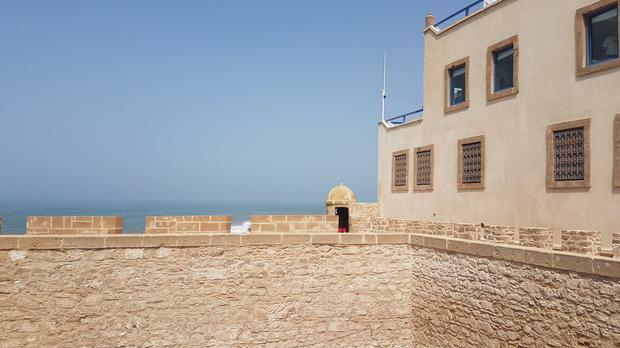 Named one of Lonely Planet's 10 Best Value Destinations 2018, Essaouira is seeing a surge of interest as intrepid travellers search for the next off-the-beaten-track yet tourist-friendly destination on the trodden map. 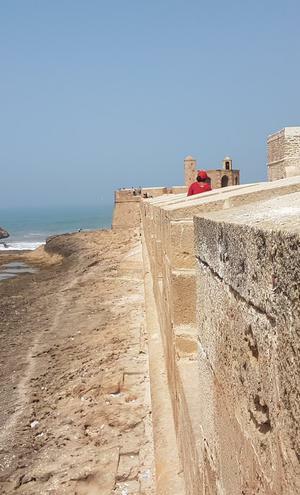 It probably helps the tourist trade too that Essaouira was a filming location for the US TV series Game of Thrones - its historic city walls a formidable backdrop for Daenerys' first meeting with her army of Unsullied in the fictional Slaver's Bay. Admittedly, six seasons behind (!) the fantasy is lost on me, however soaking up the seaside vibes I don't need a hit HBO series to tell me this place is special, and our first adventure - trying to locate our accommodation within the vivid streets with a very basic offline Google map - already fills me with excitement for this eclectic expanse. 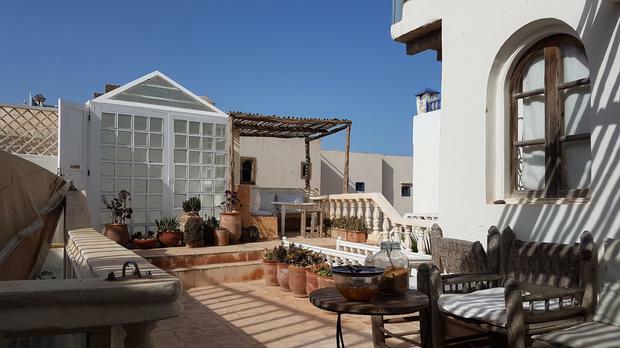 If you're looking for a honeymoon that is relaxing yet stimulating, and good value to boot, Essaouira could be a good shout. The town is known for its laid back hippy vibes, great food (the caliber of Italian restaurants a surprising aspect for many) beautiful art and picture-perfect medieval ramparts that make for as romantic a sunset as they come. 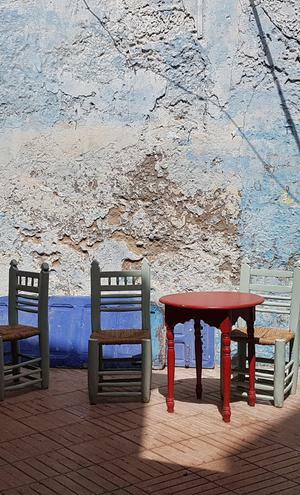 Music and art are at the heart of the old city, with wandering minstrels entertaining cafe dwellers as they sip on another glass of sweet mint tea, and there's often live music in several restaurants into the night. Locals claim Essaouira won the heart of Jimi Hendrix, who they say visited in the 60s, and tell stories of how Cat Stevens resided in this or that riad - whatever the myth or the reality, it all adds to the magic of the unique town. 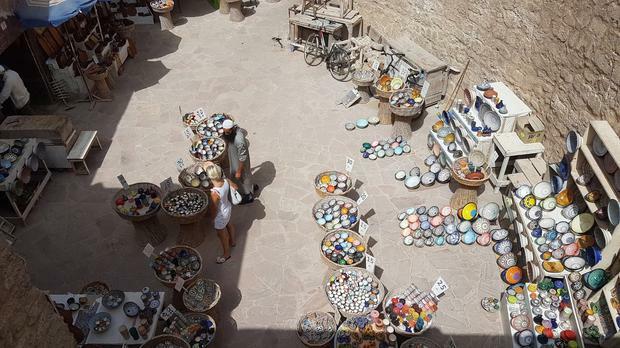 Bring an empty suitcase and fill it with trinkets from the surrounding souks (some spots have fixed prices if you're not one for haggling), and spend your mornings strolling on the beach (sunbathing or swimming not advised due to infamous high winds). Book a facial or brave a hammam, and come back with plenty of stories. Of course it's an Instagram-enthusiasts paradise too (even after a self-imposed digi-ban I found myself unable to put away my camera for more than an hour or two) so spending the day taking snaps of your surroundings is all-too inviting. Sauntering through the streets of the old town is the main activity for most in Essaouira, however it is also a celebrated spot for a surf. If water sports aren't your bag, head down to the beach for an early morning stroll or jog (the strong winds to aid you on your way!) and watch the waves roll in as the fishermen weave their nets for the day. An afternoon is well spent with a nous-nous (half espresso, half steamed milk) at Tara Cafe as you watch the world go by, before meandering down through the myriad shops (perhaps stopping to purchase a leather handbag or some colourful serving bowls and the spices to go in them) towards the European built Skala de la Kasbah - the city's impressive fortress with rows of canons. It's there you could while away the time snapping reams of dreamy photos or find yourself a seat on the walls and watch the waves below. Another breezy browse through the outdoor stalls and gallery inlets brings you to Salut Moroc, where the vibrant rooftop tiles provide the perfect contrast to the muted sea views. Grab a coffee and book a rooftop table for dinner - there will be brilliant live music and an atmosphere you won't want to miss later. En route to the harbour, stop off and meet Ahmed - he's sitting reading a book or sketching at the top of the winding stairs behind a secret door in the Bastion Ouest. Be nice and he might even show you the other side of the dwelling! Before dinner at the aforementioned Salut Maroc, or indeed the ever-popular rooftop restaurant Taros Cafe, meander down to the harbour and watch the fishermen hook the catch of the day as they battle with bold seagulls nearby. Essaouira is a fishing village, so of course when you're there you have to try the local catch of the day. Head down to the harbour and haggle for your dinner before bringing your prized fair to one of the many nearby restaurants where they will grill it up with some delicious sides. Grab a fish for about €1 (10 Dirham) and a bag of sardines for 50cent and have it served to you with bread and some salad for less than a fiver. If you need a break from Moroccan grub, Essaouira has plenty of alternatives. We had a brilliant burger lunch with hand cut chips and a sweet side salad in Mactoob for approx €6.50 (70 Dirham), and some tasty pizza in Silvestro for around €8.50 (90 Dirham). With an urge for something a little 'healthier' late one evening we walked about 500 metres from our bed to Triskala, on recommendation from our riad. Arriving at 10pm we were surprised to get a table at this popular vegetarian and vegan spot (they also serve fish), and it wasn't long before we had devoured a smorgasbord of beautifully baked falafel, pomegrante, sesame beans and pickle and a carrot and lentil tagine I'm determined to recreate at home. The menu changes daily, but if the beetroot brownie is there leave room - just don't ask for a coke with your meal - Triskala have a natural sugar 'soft drinks' policy and they're not shy about pointing it out. We spent around €13 (140 Dirham) between us for mains and a shared dessert (that, admittedly, I had wrapped up and ate in bed later!). La Table by Madada is known as Essaouira's most expensive and exclusive restaurant. You can get a main meal here for under €20.00, and by all accounts the argan oil mashed potatoes are not to be missed. Again, as with the more popular restaurants in Essaouira, to get a good table booking is recommended. Goats cheese filled fried briouats in any cafe are standard (try not to order a second round, just try) while the chicken pastilla - a Moroccan sweet and savoury filo pastry pie filled with meat and topped with icing sugar - was a little too sweet for our tastebuds (although we did make light work of the filling by itself). Like everywhere, you can go high end with Essaouira, and for that the 19th century, five star former châteaux Heure Bleue Palais with its bijou spa and rooftop pool is a honeymooner's dream. Somewhere between a riad and a hotel, the Heure Bleue offers luxury and relaxation, making your Moroccan stay all the more effortless with guided city tours, private transport and activities such as home cinema, cooking classes, and an in-house bar and lounge serving alcohol. Rates per night are from €180.00, visit mrandmrssmith.com for more. We flew with Ryanair which operates flights between Dublin and Marrakech on Wednesdays and Sundays, before taking the SupraTour bus* from Marrakech to Essaouira. Bis tickets cost €7.30 (80 Dirham) each way. Buy your tickets at the desk on the day of travel (they can't be purchased online) and remember you must buy an extra ticket for 10 Dirham for any luggage (which we discovered after being in the queue for the bus for twenty minutes). *If you're heading in from Marrakech on a private tour, ask your driver to make a special stop for the argan nut foraging tree-climbing goats en route - and have your camera at the ready! 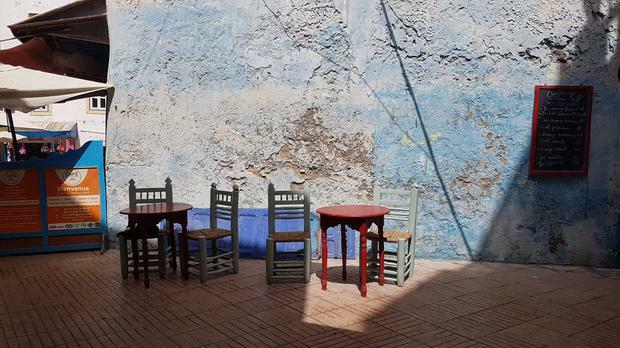 Into the Blue: Why is this Moroccan town so beautifully blue? Tara McLeod Williams for Irish Brides I’m sitting on the bonnet of a very hot jeep, and I’m sweating. Jillian Bolger As our speedboat scuds through the waves the horizon is broken only by palm-tufted islands. THE VOW Trying to squeeze Venice into a day trip is wrong.